We are an independent full service escrow company specializing in Resales, Short Sales, Refinance, REO, AITD, and Creative Financing. We are licensed under the Department of Business Oversight License# 963-1048 and have been serving Southern California since 1983. Mission Country Escrow is a 2nd Generation Family owned Escrow Company. Dennis and Jeanne Carpenter opened our doors on June 1, 1983 with our first location on the corner of Oso and Marguerite Parkway. Jane Jackson, Jeanne’s “Big” sister, joined us and opened our Branch office in Dana Point in 1988. 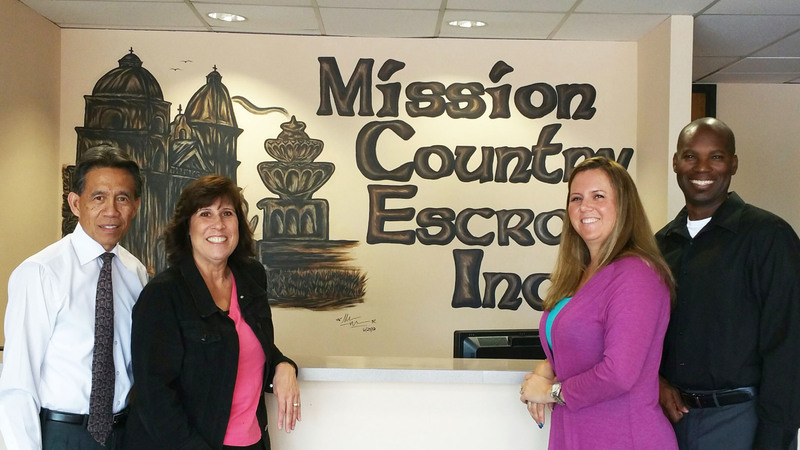 Dana Paikai has been with Mission Country Escrow since day one and is the backbone of who we are. Dana had the privilege of working alongside Jeanne and Jane through all these years and is still here carrying out their philosophy of treating our clients like family. Jane’s daughter Kathleen “Katie” Brown joined the company while still in High School and quickly decided that she wanted to make escrow her career. Her husband Troy Brown decided that he too would like to be a part of the family business and joined the company in 2002. When Dennis and Jeanne decided to retire, Katie and Troy took over the business and continue to keep the family legacy going. Even though Dennis, Jeanne and Jane are no longer as visible as they were in the past, their presence and input are still a crucial part of who we are today, making us one of the oldest Independent Escrow Companies in Orange County. Buying and selling a home can be a very emotional experience. Here at Mission Country Escrow we understand the factors that come into play during the escrow process, and we work with real estate agents, buyers, sellers, lenders, insurance agents, termite inspectors, homeowner associations, title companies and others to make your escrow transaction an efficient and pleasant experience. This is truly the key to keeping your escrow on track. We make it our business to keep all participating parties of the escrow informed about the activities of each escrow procedure. Good communication insures successful cooperation between parties. Mission Country Escrow is a full service, independent escrow corporation. We are governed by the rules and regulations of the Department of Business Oversight. Our only business is escrow and service to you! Be assured your clients funds will be secured with the Bonding requirements and Audit Procedures of an Independent Escrow Company! All rights reserved © Mission Country Escrow, Inc.